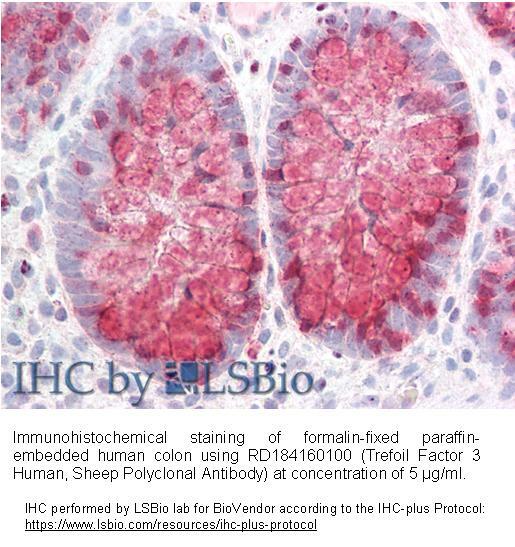 The antibody was raised in sheep by immunization with the recombinant Human Trefoil Factor 3. The immunization antigen (7.82 kDa – calculated) is a protein containing 69 AA of recombinant Human Trefoil Factor 3. N-terminal His-tag, 10 extra AA (highlighted). Immunoaffinity chromatography on a column with immobilized recombinant Human Trefoil Factor 3. Trefoil factor 3 (TFF3, also known as intestinal trefoil factor) belongs together with TFF1 and TFF2 to a small group of mucin-associated peptides. TFF3 contains seven cysteine residues, six of which form disulfide bonds to create a characteristic three-leafed structure. Due to its compact structure, TFF3 is extremely resistant toward acids, proteolytical cleavage or heat degradation. Monomeric form of TFF3 consists of 60 amino acids and has 6.7 kDa, while the dimer (13.1 kDa) consists of 118 amino acids. TFF3 is expressed mainly in gastrointestinal tract, in the mucous cells of the small and large intestine, where it maintains the integrity of mucous layer and in cooperation with mucins protects the gastrointestinal epithelial cells against various injurious agents. However, TFF3 was also detected in salivary glands, posterior pituitary gland and in the inner ear. Secretion of TFF3 is triggered by the presence of certain inflammation mediators and neurotransmitters. Studies showed that oral administration of TFF3 in rats protects gastric mucosa from damage. Over-expression of TFF3 occurs at the sites of damage of the gastrointestinal tract, e.g. peptic ulcer or inflammatory bowel disease. Patients suffering from these diseases have increased levels of TFF3 in serum. TFF3 was reported to be over-expressed also in patients with various neoplasms including intestinal, pancreatic and prostate carcinomas. On the contrary, its expression decreases in thyroid follicular carcinomas. In vitro studies showed that in breast cancer cells, expression of TFF3 is regulated by the level of estrogen. Recent study with human and rodent pancreatic islet β-cells has demonstrated that TFF3 overexpression increases their proliferation. Both major forms of diabetes involve a decline in islet β-cells mass and their controlled expansion would have great potential utility for treatment of this diseases. Another study with rats has shown that urinary TFF3 protein levels were markedly reduced in response to renal tubular injury, while his levels did not respond to nonrenal toxicants.